GRANDER® Inline Units are available for installation in the main water supply of private houses, medium-sized and large buildings as well as industrial plants. When selecting the right unit, one has to consider not only the pipe dimension and peak usage times, but also the stress factor and the installation situation on site. The trained and competent GRANDER® adviser supports and advises customers on the proper choice of the unit size. GRANDER® Inline Units can be installed in every possible position in the drinking water area. The revitalizing effect of the GRANDER® Inline Units is maintained over several years of usage. The effects have been reported by satisfied users for more than 20 years. 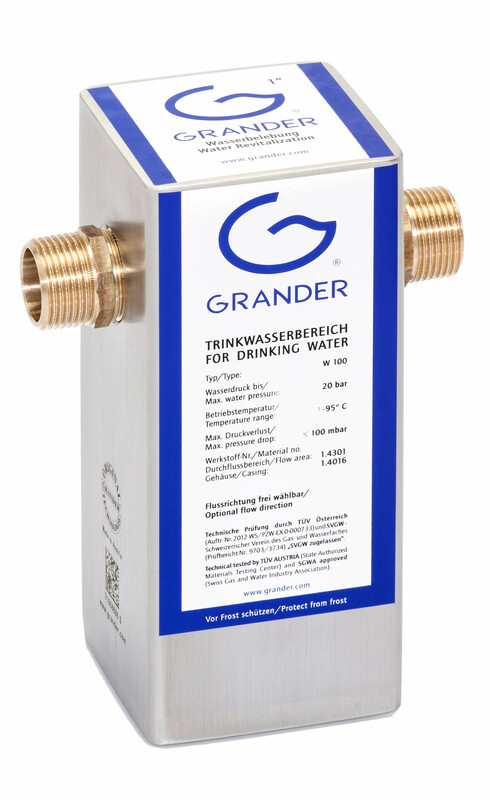 The hygienic and technical harmlessness for the use of the GRANDER® Inline Units in drinking water is confirmed through an expert review (University of Graz, TUEV Vienna). GRANDER® Inline Units work with natural energy, without electricity or additives and are service- as well as maintenance-free. GRANDER® Inline Units are solidly made of top-quality V2A stainless steel and therefore guarantee longer durability. For special uses there are units (from ¾\") available in acid-resistent V4A stainless steel.